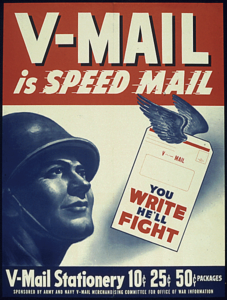 Victory Mail (aka V-Mail) was used to reduce the weight of mail being sent between soldiers and their friends and family on the home front. Letters were written on a standardized form that acted as both letter and envelope when folded. The V-Mail was then sent to a processing center where a special machine took images of the letters and created rolls of microfilm that were shipped to processing centers near the letter’s final destination. Finally, the images were reproduced at one-quarter its original size and delivered. Evelyn “Lois” Dozier Norvell (1917-1986) was born in Athens, Georgia, on December 24, 1917. 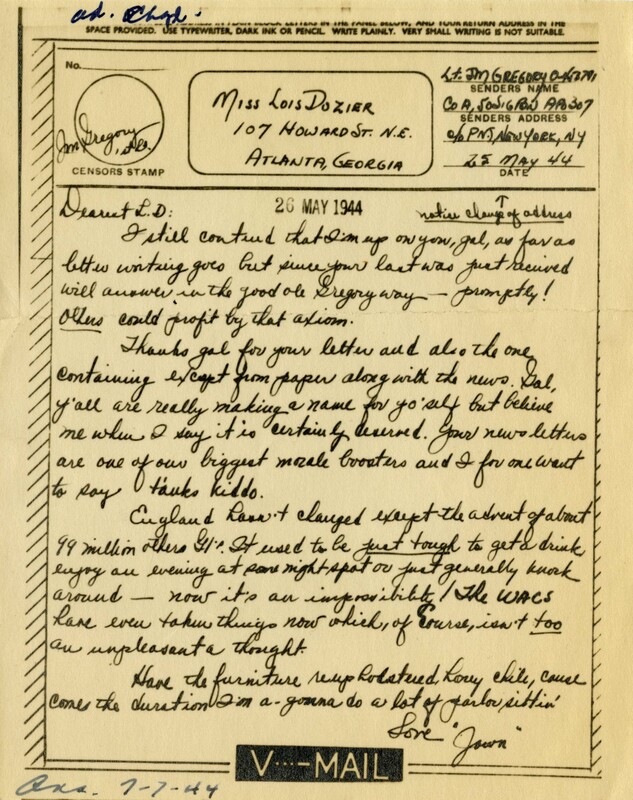 During World War II, Lois sent and received letters from men and women in military service. Lois received many letters from soldiers though Victory Mail. Most of her correspondents were students from Georgia Evening College (now Georgia State University) where she graduated in 1942. Once a month, Lois published a newsletter providing information about the soldiers who wrote her letters. Lois received awards and public notoriety for this and her other activities in the war effort. 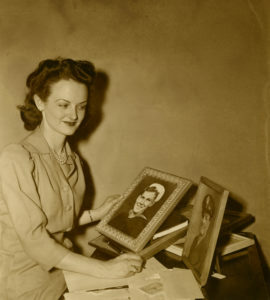 During World War II, Lois was advertising manager for Atlantic and Pacific Tea Company, but she relinquished the job when the former advertising manager returned from the war. On February 19, 1949, Lois married Lauren Gardiner Norvell (1910-1981), cousin of Oliver Hardy. 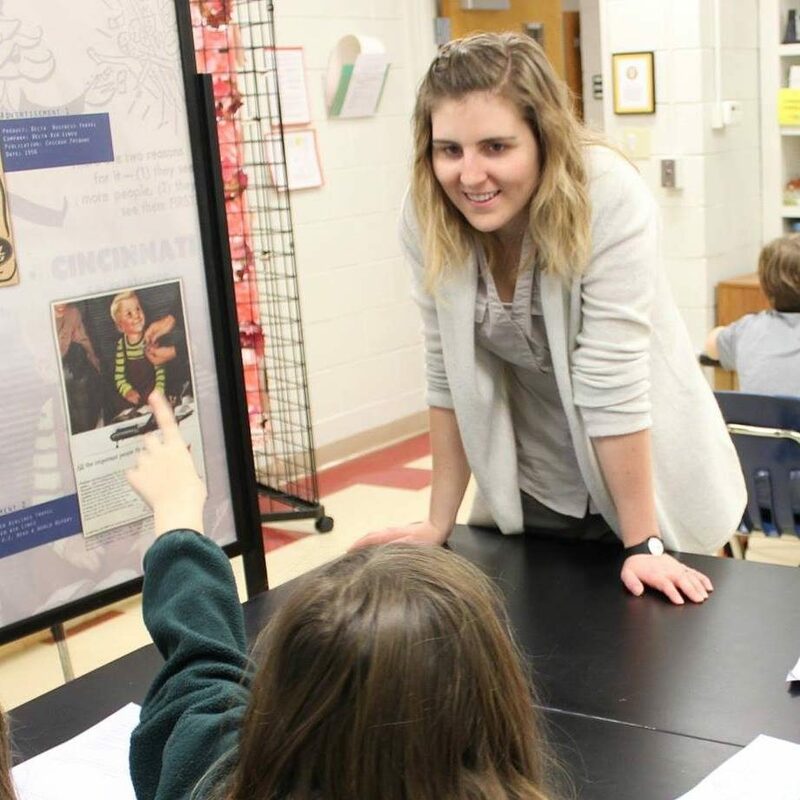 From approximately 1954 to 1964, Lois was an assistant editor and advertising manager of The Coca-Cola Bottler in Atlanta, the company magazine for Coca-Cola. She died on October 15, 1986, and is buried at Shiloh United Methodist Church in Thomson, Georgia. V-Mail from Lt. J.M. Gregory to Lois Dozier, May 26, 1944. From the Lois Dozier Norvell Papers, MS 1690. Courtesy of the Georgia Historical Society. I still contend that I’m up on you, gal, as far as letter writing goes but since your last was just received will answer in the good ole Gregory way—promptly! Others could profit by that axiom. Thanks gal for your letter and also the one containing excerpt from paper along with the news. Gal, y’all are really making a name for yo’self but believe me when I say it is certainly deserved. Your newsletters are one of our biggest morale boosters and I for one want to say t’anks kiddo. England hasn’t changed except the advent of about 99 million other GIs. It used to be just tough to get a drink, enjoy all evening at some night sport or just generally knock around – now it’s an impossibility! The WACS have even taken things now which, of course, isn’t too an unpleasant a thought.